While many parts of the country are closing their libraries down, last month Birmingham opened a new one. It's a monster among libraries, a nine storey beacon of regeneration, glistening in gold and silver on the rim of the city centre. It replaces Birmingham Central Library, a brutalist 70s creation overlooking Chamberlain Square. This upturned concrete ziggurat divided opinion, loved by some, hated by others, and a replacement was funded just before the economic downturn hit. All the books were relocated to the new building earlier in the summer, and you still walk through the heart of the old reference library (an ugly shopping mall) before crossing to the new site in Centenary Square. And there it stands, a completely different style of pyramid covered with circular bling - an asymmetric wedding cake with a golden cylinder on top. It cost £189m, which some have said would have been better spent elsewhere. But it is undeniably impressive, the kind of showcase building that England's second city mostly lacks. It's the Library of Birmingham. and crowds are still flocking to see inside. The building's being marketed as a visitor attraction as well as a library. 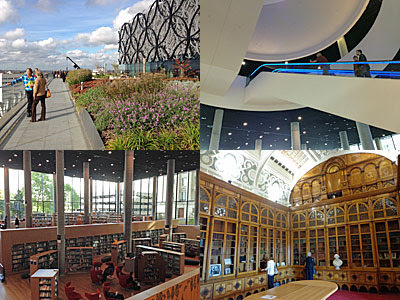 That's good if you'll never have a Birmingham library card, but it also attracts residents inside who might not otherwise consider availing themselves of the library's services. A Visitor Guide and Floor Plan is available, including a Building Highlights Trail which they reckon takes an hour, and I'd say that's about right. It is that big a building, as befits the most populous urban district in the country. The main lending library is downstairs, on the largest floor (continue past the cafe and the escalators). They've called it the Book Browse, because Fiction Section isn't alliterative, and here you'll find the popular stuff in that modern 'covers face up' style. It's a lofty pillared space with a Digital Gallery projected on one wall - this probably a better idea in the mind of the designer than in reality. The children's library is a level lower down, complete with extensive 'Story Steps' when parents can read to their offspring. 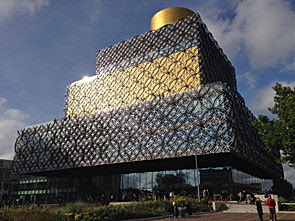 And then there's the music library, poking out beneath Centenary Square and arranged round a glass-edged amphitheatre. It's extensive, from books on 80s pop to classical scores you can browse and tinkle on an adjacent electric organ. Top marks for the music section. Most casual visitors will miss the ground floor, lured up a level, and up a level, and up a level, by a series of escalators. These glow electric blue under the handrail, adding a futuristic air to the interior. The next three floors have all the non-fiction books, and plenty of users browsing, perusing or taking notes. Most of the shelves look ordinarily library-like, but a ring around the central atrium contains older more valuable hardbacks, accessible via staff-only staircases, and an imposing backdrop to your ascent. The third floor has an exterior terrace, or indeed roof garden, along two sides. This is a magnet for visitors, and especially locals, who can get a high-level view across Birmingham that's not generally available. To be fair the Birmingham skyline's not especially memorable, lacking in signature highrises and dotted with bland office towers. The Rotunda's quite some distance away, and there's no sign of the bobbly metallic Selfridges from here. But there's Centenary Square down below, and the old library to one side, and plenty of traffic-filled arterial roads threading through. Floors five, six and seven are staff only, providing office and storage space. But it is possible for the public to get higher via the lifts or a lengthy back staircase (90 steps to be attempted only if fit). Or there's a glass lift that shuttles between floors 4 and 7, rising through an internal void so not for those with vertigo. It's only small, but very enticing, so expect long queues if you choose it. The ordinary lifts or stairs are a better bet, and then the queues for coming down in the glass lift are much shorter so you can enjoy it then. Wheeee! The only public space on the seventh floor, other than a narrow passage, is the Secret Garden. Obviously it's not that secret, it's mentioned on the map and floor plans, but you probably wouldn't think to come up here unless nudged. It takes the form of two more terraced balconies, on different sides of the building from before, permitting views to the north and to the west. This is a great place to sit amongst the colourful plants, or (if you're local) to promenade round the edge pointing towards some distant suburb and exclaim "I live there". As a non-expert on the geography of Birmingham I wasn't able to identify much, but various tower blocks and multi-storeys and the BT Tower were bright and clear in the foreground. And there's one more secret hidden inside the golden cylinder on the top floor. You can take the lift, but the stairs are much more interesting and wind through some unseen internal space to reach the summit. Facing the city centre is the Skyline Viewpoint, a small internal lounge with a couple of comfy sofas. But then through a side door is the most unexpected feature in such a modern building - the original 1882 Shakespeare Memorial Room. This is a high rectangular room decorated in an Elizabethan style, with splendid carvings, marquetry and metalwork representing birds, flowers and foliage. It was created to house the council's collection of Bard-related volumes, but had no place in the 1974 library so was almost lost, and has only now been restored to absolute pride of place. The walls seem more interesting than the contents of the shelves, but its survival is a fitting tribute to the West Midlands' most famous son. Birmingham and books, they still thrive together.